European Commission › EURAXESS › EURAXESS Worldwide › EURAXESS Japan › Pitch your research work at the Falling Walls Lab Tokyo 2018 & win a trip to Berlin! 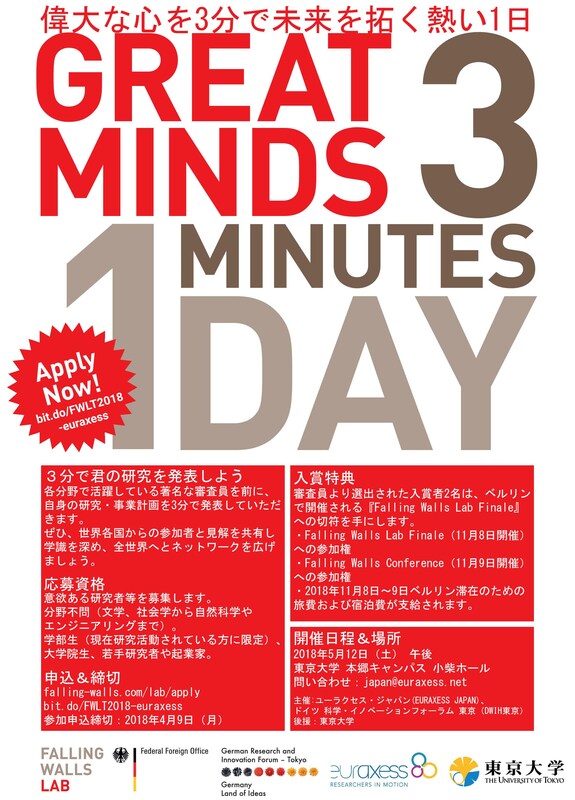 Pitch your research work at the Falling Walls Lab Tokyo 2018 & win a trip to Berlin! The Falling Walls Lab Tokyo (FWLT) will take place on 12 May 2018 in Tokyo! Based on the idea of "breaking down various walls" around the world, this event provides students, young researchers and professionals of all disciplines and nationalities an opportunity to present their research projects or ideas in 3 minutes and in English, in front of a non-specialised audience. Winners will be sent to the global FInale of the Falling Walls Lab in Berlin in November. Our online call for abstracts is open until 9 April; all details are available on our dedicated event webpage. Looking forward to receiving your contributions! How to draft a good abstract (and talk) for the Falling Walls Lab Tokyo 2018?